5-way adjusting tilt columns for those who want great performance at affordable pricing. Made from steel 2" tube for automatic column shift and all floor shift applications. Columns come with 3/4"-36 output shafts. 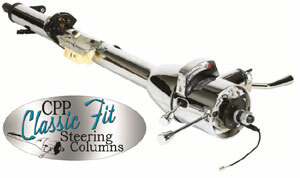 All columns accepts any 1967-94 GM steering wheel or aftermarket adapter. 1967-72 truck columns feature factory style floor seal, retaining ring dash seal and knobs. Universal columns come with 1 DD output shaft and accept any 1967-94 GM steering wheel or aftermarket adapter. Column shift columns come with both 3-speed and 4-speed shift indicators.